‘Stepney’ on the Bluebell Railway (As the Brighton Works shunting locomotive). In the 1980’s the Bluebell Railway modified the ‘Stroudley Improved Engine Green’ livery, of their preserved ‘Terrier’ No:55 ‘Stepney’, to represent long scrapped sister locomotive DS377 ‘Brighton Works’. 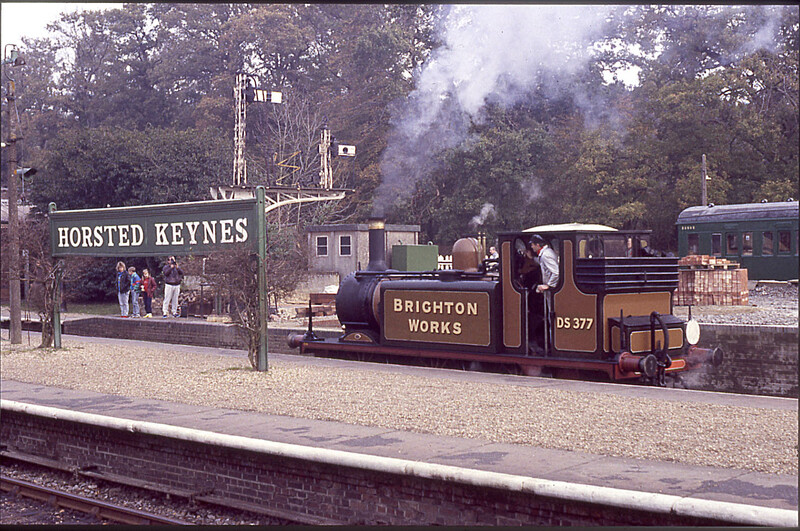 Seen here in the platforms at Horsted Keynes station, the original DS377 was originally built as No:35 ‘Morden’, and as the Brighton Works shunter carried an LB&SCR ‘Stroudley’ style livery until withdrawal early in the 1960’s. There are no photographic records of the engine ever venturing the short distance along the Sussex coast towards Hayling in this condition – unless of course any ‘HB50’ reader out there knows different! (Photo by Ian Edwards). Previous: ‘Stepney’ on the Bluebell Railway (As the Brighton Works shunting locomotive). Next: ‘Newington’ at the ‘Hayling Billy’ pub at Mengham on Hayling Island.